I came up with this tip for [tag]basketball coaching[/tag] from one of my subscribers. It relates to [tag]basketball skills evaluation[/tag] of your players and includes some great tips you can begin using with your team right away. 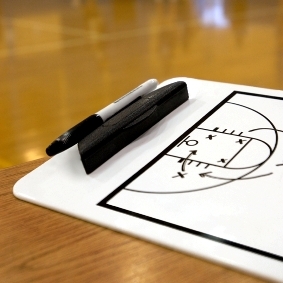 The tip I would like to share is habit awareness for [tag]basketball drills[/tag]. The first aspect is about stance and body position concepts, I key my players as keeping a tomahawk stance. The second aspect deals with holding the [tag]basketball[/tag], I key as keeping the ball in the square. I am currently spending time with four of my former players for half an hour each week prior to their regular team training. The deal was to come and watch them play then discuss and develop an individual improvement program. What I found watching their games was they were not consistently translating the skills they practiced in training as habits into their games. The two aspects underpinning why this wasn’t happening was their awareness of body and ball position. There are a number of ways for coaches to attack this problem including video analysis and developing a buddy system. Now I know we all drill these aspects at one time or another but then move on because of other more pressing needs such as skill development, team work and fitness. Instead of the focus being mechanical alone on having knees bent etc., relate it specifically to a game or [tag]basketball drill[/tag] situation.